I've been searching the difference between Select and SelectMany but I haven't been able to find a suitable answer. I need to learn the difference when using LINQ To SQL but all I've found are standard array examples. Can someone provide a LINQ To SQL example? Select many is like cross join operation in SQL where it takes the cross product. Note that here we take the all the possible combinations that can be made from the elements of set A and set B.
SelectMany() lets you collapse a multidimensional sequence in a way that would otherwise require a second Select() or loop. More details at this blog post. There are several overloads to SelectMany. One of them allows you to keep trace of any relationship between parent and children while traversing the hierarchy. Example: suppose you have the following structure: League -> Teams -> Player. You can easily return a flat collection of players. However you may lose any reference to the team the player is part of. The previous example is taken from Dan's IK blog. I strongly recommend you take a look at it. I understand SelectMany to work like a join shortcut. Select is a simple one-to-one projection from source element to a result element. 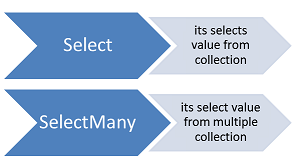 Select- Many is used when there are multiple from clauses in a query expression: each element in the original sequence is used to generate a new sequence. Some SelectMany may not be necessary. Below 2 queries give the same result. if Start from "1", SelectMany is needed, it flattens the many. both return the same ApplicationUser list for the selected Organization. The first "projects" from Organization to Users, the second queries the Users table directly. One more example how SelectMany + Select can be used in order to accumulate sub array objects data. It is the best way to understand i think. Not the answer you're looking for? Browse other questions tagged c# linq-to-sql linq or ask your own question.